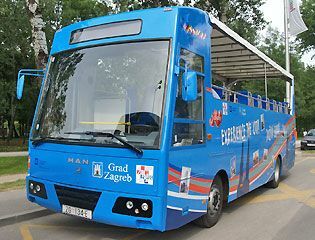 The Zagreb Tourist Bus is an easy way to see the major sights of Zagreb and beyond. You can hop on and off as you like, taking time to explore Zagreb sights. While on the bus you can listen to a narrative (in English or seven other languages) explaining Zagreb's sights. There's a "red line" and a "green line". For an introduction to Zagreb, I recommend the "red line" as it covers most major sights in Zagreb's Upper and Lower Towns plus Mirogoj cemetary. The "green line" goes a little further afield to Lake Jarun, Maksimir Park and the Museum of Contemporary Art. Both lines depart from Kaptol near Zagreb's Cathedral. The red line runs every 90 minutes from noon to 6pm and the green line runs twice a day at 2 and 4pm. The lines are in service only during the tourist season from June to September. Tickets are 70Kn and can be purchased from the driver. Click here for a map of the tourist bus lines, timetables and other information in Croatian or contact the tourist office. On weekends, you have the opportunity to hop aboard Zagreb's tourist train.